Choosing a color to paint a room is difficult, you have to decide on something you can live with for many years. That's my current dilemma. 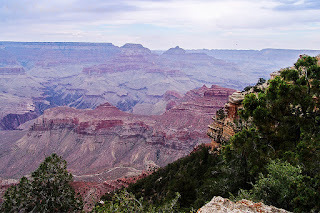 :-) The colors of the Grand Canyon are quite beautiful even under cloudy light. I took this shot on a day we were walking the trail you can see in the shot. I didn't have enough time to walk the whole way because we had to catch the train but I was on the part you can see in the image. The black dot in the sky is not dust but is actually a Condor. Very cool birds and I was able to capture one up fairly close.